Home > Books > History > Revolutionary history > The New Civilisation? ‘this excellent book should find a place on the shelf alongside earlier work covering similar subject matter by Jones, Williams, Caute, and Stone. The first years of the Soviet Five-Year Plans witnessed an upsurge of interest in the Soviet Union. In hundreds of books and thousands of articles, commentators of all political outlooks expressed their opinions on the novel features of Stalin’s Soviet Union – industrial construction and agricultural collectivisation, show trials and state terror, Popular Fronts and collective security. What was the Soviet Union? Was it a totalitarian threat to Western civilisation, or was it a utopia taking shape before our eyes? Was Stalinism the logical outcome of the October Revolution, or did it represent its betrayal? Was there anything that Western countries could learn from the Five-Year Plans? These were just some of the questions asked. 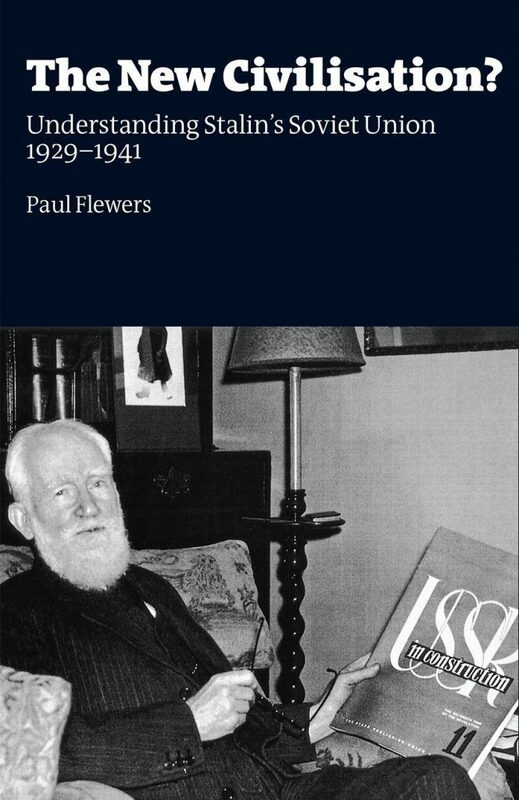 Written in a lively manner, this book covers a vast range of material published in Britain, from the far left to the far right, from the well known to the downright obscure, on all aspects of the Soviet Union during 1929–1941, and draws out the impact of the Soviet experience upon British intellectuals and political trends. Paul Flewers has been involved in left-wing politics since the 1970s. He studied at the School of Slavonic and East European Studies, University College London, where he obtained his PhD. He is a member of the editorial boards of Revolutionary History and New Interventions. In The New Civilization? — the title is a comment on the Webbs’ infamous volume heaping praise on Stalinism, they dropped the question mark in the second edition — Flewers examines the ways in which what was happening in the Soviet Union was understood in Britain, from the victory of ‘socialism in one country’, the Third Period, and the launch of the first Five Year Plan in 1929 until Hitler betrayed his Russian allies and invaded the Soviet Union in 1941. This is not a study of public opinion or the beliefs of state functionaries who informed policy, but an attempt to capture how the Soviet Union was perceived by the authors of a wide range of books and articles in journals and magazines published in Britain during this period. What is less clear is the impact that this kind of writing had on its readers. Drawing on the still tremendous resources of London’s libraries, Flewers has unearthed a wealth of material, some of it from sources that are well known if rarely read, some from books and periodicals which have been long forgotten. While doing justice to the differences in each category and the overlaps between them, he divides opinion into three broad categories. First, the ‘anti-communist current’, a conservative, right-wing strand which in traditional terms emphasized state repression, lack of liberal democracy and civil liberties, and the threat of revolution Russia was seen as offering to the west; second, ‘the centre ground’, sometimes taken up by moderate Conservatives, liberals, and social democratic opinion, which deplored the negative features of the USSR and refused to endorse it but sometimes felt, particularly after 1933, that Stalin might be moving with some amount of sincerity from the encouragement of revolution to peaceful coexistence and that the experiment might hold lessons for economic and social engineering in a reformist world; and finally the ‘pro-Soviet lobby’, the CP, its periphery, and its fellow travellers, as well as assorted, sometimes eccentric, intellectuals most of whom had little time indeed for Stalinism in Britain but applauded it as suited to the conditions of Russia. On the fringe were dissident communists who tried to walk a line between demanding the transformation of the Soviet Union and defending it as it stood as, on the whole, preferable to capitalism. Flewers quotes observers and visitors on the importance of understanding and speaking Russian — which few did — in relation to gaining some awareness of the realities of life and politics in Russia. Nonetheless, favourable and unfavourable judgements were often bound up with events in Britain and different reactions to them projected onto what became a happy land far away or, more rarely, an economic and political dead end or a threat to western civilization. Particularly during the years 1934 to 1939, the British environment was in certain ways helpful to the encouragement of sympathetic opinion. The sense and to some degree the reality of capitalist crisis was combined with the development of the threat of fascism. The turn away from revolution — even Sir Oswald Mosley wondered whether Stalin had now become a nationalist, content with revolution in one country — to collective security against fascism and the popular front, and the perceived if exaggerated and hyped success of Soviet planning, made for constructive interest in what was happening in the East. The number of CP members increased, although at a far from significant rate. In the author’s view admiration and support for the Soviet Union among members of the Labour Party has been overstated in some past accounts, while the CP remained tiny and fellow travellers were not typical of the non-Communist left. Despite the high standing and public visibility of prominent sympathizers, events in the 1930s moved against the pro-Soviet lobby. The Moscow trials gradually caused greater disquiet than has sometimes been acknowledged and they sowed seeds of disillusion in a system claiming to be socialist. While some observers remained willing to overlook or delude themselves and others about issues of democracy, liberty, the rule of law, and workers’ control, and some still saw in the Soviet Union a ‘workers’ state’, Flewers argues that by 1941, under the influence of the Molotov-Ribbentrop pact and the Soviet invasion of Finland, the centre ground had crumbled. Democratic socialists increasingly defined themselves against Stalinism in terms of parliamentary democracy, the accountability of the state to its citizens, and the view that revolution on the Russian model was not just a different and more dangerous and violent road to socialism but the road to dictatorship, suppression of freedom, and social disaster. There was growing, if never complete, common ground between the anti-communist current and the formerly sympathetic centre ground, and ‘official Communism’ was often assimilated to its Fascist ally as the ideology of a totalitarian state and mass society. Flewers argues further that the progress and, to an extent, popularity of Stalinism marginalized the idea of a democratic supersession of capitalism by workers themselves and distorted the central idea that socialism was about workers’ selfmanagement. The idea of state socialism, democratic or authoritarian, became dominant on the left. In contrast to simplistic connections made by some academics, any influence Soviet planning had on the changing ideas of the Labour Party after 1930 has to be seen in the context of basic political conflicts between labourism and Stalinism, even if we pay regard to the influence Fabian elitism and paternalism exerted on the former. British interest in Soviet planning was generally careful and critical; it was rooted in longstanding economic developments within capitalism. Planning was already a distinctive part of political discourse in Britain rather than stemming from any identification with the methods of ‘official Communism’ in Russia during the 1930s. Interest was predominantly defined by the belief that lessons might be drawn for capitalist or perhaps democratic socialist economies, to be suitably applied in a very different economic, social, and political framework. The book places a great deal of importance on the changes in thinking about the Soviet Union which occurred at the end of this period. Flewers argues convincingly that the views which began to prevail in 1939–1941 of Russia as a nationalist power pursuing expansionist territorial interests which threatened western democracy and European civilization influenced later Cold War thinking. They exercised particular influence on the theories of totalitarianism based on the equivalence of the similar but distinct theories and practice of fascism and Stalinism, which became dominant on the left as well as the right after 1947. The study is successful in recalling those who took the time and possessed the perception to see things as they were, not only George Orwell but others such as Henry Brailsford and Nigel Balchin, and those who attempted serious analysis of the Soviet Union — from Trotsky on the left to Waldemar Gurian on the right. 2 See, for example, Nigel West, Venona: The Greatest Secret of the Cold War (London: Harper Collins, 1999); John Curry, The Security Service, 1908–1945: The Official History (Kew: Public Record Office, 1999); Christopher Andrew and Vasili Mitrokhin, The Mitrokhin Archive: The KGB in Europe and the West (London: Allen Lane, 1999); Miranda Carter, Anthony Blunt: His Lives (Basingstoke: Macmillan, 2001); Peter Hennessy, The Secret State: Britain and the Cold War (London: Allen Lane, 2002); Phillip Knightley, The Life and Times of the KGB Masterspys (London: Andre Deutsch, 2003); Michael Smith, The Spying Game (London: Politicos, 2003); Andrew Cook, M: MI5’s Spymaster (Stroud: Tempus, 2004); Christopher Andrew and Vasili Mitrokhin, The Mitrokhin Archive: The KGB and the World (London: Allen Lane, 2005); Andrew Meier, The Lost Spy: An American in Stalin’s Secret Service (London: Weidenfeld and Nicolson, 2009). 3 See, for example, two very different books, Willie Thompson, The Good Old Cause: British Communism, 1920–1991 (London: Pluto Press, 1992); James Eaden and David Renton, The Communist Party of Great Britain since 1920 (Basingstoke: Palgrave, 2002). 4 Nina Fishman, ‘Essentialists and Realists: Reflections on the Historiography of the CPGB’, Communist History Network Newsletter, 11 (2001); John McIlroy and Alan Campbell, ‘Histories of the British Communist Party: A User’s Guide’, Labour History Review, 68 (2003), 33–59. 5 Samuel Selwell, ‘Bloomsbury-Bolshie Ballads’, Adelphi (March 1933), quoted in Flewers, New Civilization?, p. 11. 6 Flewers favours the analysis of Hillel Ticktin, Origins of the Crisis in the USSR: Essays in the Political Economy of a Disintegrating System (New York: Armonk, 1990). Many of the theories about what kind of society the Soviet Union was have recently been discussed in Marcel van der Linden, Western Marxism and the Soviet Union (Leiden: Brill, 2007). 7 Bill Jones, The Russia Complex: The British Labour Party and the Soviet Union (Manchester: Manchester University Press, 1977); Andrew Williams, Labour and Russia: The Attitude of the Labour Party to Russia, 1924–34 (Manchester: Manchester University Press, 1989); David Caute, The Fellow Travellers: A Postscript to the Enlightenment (London: Weidenfeld and Nicolson, 1973); Dan Stone, Responses to Nazism in Britain, 1933–1939: Before War and Holocaust (Basingstoke: Palgrave, 2003). In this extensively researched book, Paul Flewers sets out to correct two misconceptions about how the USSR was seen and discussed in the west during the 1930s. This study, though, has implications beyond the detail of the period it covers: it is a contribution to our reckoning with the ways adopted to achieve socialism in the 20th century. Flewers confronts two myths about western views of the ‘Soviet experiment’. Firstly, that only ‘official communists’ and fellow travellers were sympathetic to the USSR; the legend being that 30s intellectuals were supposed to have seen the USSR as revolutionary socialist, at least in embryonic form or aspiration, and either supported or flatly opposed it. Secondly, that no-one then had much access to the facts on which to base a sound judgement. Flewers’s in-depth research shows that that these ideas are a reading back from the cold war. Such a picture of how people ‘chose sides’ in the 30s exonerates both the ‘official communist’ and anti-communist alike: only some were ‘taken in’, it suggests, and understandably because they lacked the necessary information. The fashion at the turn of the millennium was to assume that the Soviet Union was regarded in the 20th century with either absolute devotion or dismissed as backward and irrelevant. This certainly neglects how many politicians and commentators over a broad political spectrum once regarded the USSR as an experiment in state intervention, statism, some of which they could learn from; or as an ally, which at a certain time they could unite with. After the decline of the revolutionary wave across Europe in the early 1920s, western trepidation was often replaced by interest. State intervention was already a growing force in the west, especially during and after World War I. Many who would not have described themselves as socialist or communist simply saw the Soviet Union as an extreme example of such government assistance to society and the economy. To this ‘centre ground’, the first five-year plan (1929-34) was of particular interest. In 1929, The Economist commented that the plan was °∞of incalculable value to economists and administrators all over the world°± (April 27 1929). Liberals like Ernest Barker called the politics of the USSR ‘a new form of democracy’ (International Affairs November 1934). World War I then had provoked a growing interest in planning as such and by the 1930s centrist commentators were struggling to draw up strategies to deal with problems at home and abroad. None other than Neville Chamberlain declared in March 1933 that the development of the Soviet economy could actually be beneficial to world trade. Not that liberals and conservatives argued for the total transplant of Stalinism to the west. Even the Webbs, pre-war Fabian propagandists for nationalisation, were not totally sold. In their 1937 work Soviet communism, a new civilisation, they expressed admiration for the control of °∞waste°± by the Bolshevik state and the lack of a need to strike by Russian workers. However, they also complained about the new civilisation’s ‘disease of orthodoxy’ and the ‘discouragement and even repression of independent thinking on fundamental issues’. As the depression bit deeper, it concentrated even more minds: free markets seemed the disease, not the cure. When Germany became a greater threat with fascism, the USSR was sought as an ally for ‘collective security’. Nevertheless, the Moscow trials, persecuting often committed Bolsheviks, still provoked special condemnation. The Economist described the defendants’ confessions as ‘utterly unconvincing in the absence of other evidence’. The otherwise sympathetic civil servant and historian EH Carr dismissed all apologies for the trials. However, the new pro-Soviet consensus was building – the one that took Nazi Germany to be the greater danger. With the advance of this movement of bourgeois anti-fascism, many began to give Stalin the benefit of the doubt. A critic of the USSR’s internal arrangements like Henry Wickham Steed could still write about the trials that beneath the ‘highly improbable’ confessions must stand ‘a considerable substratum of truth’ (International Affairs March 1937). In 1938, even Lloyd George and Churchill urged prime minister Chamberlain to forge an alliance with Russia. The consensus then that George Orwell found himself up against in trying to publish Homage to Catalonia and later Animal Farm was not strictly a pro-Stalinist consensus, but an anti-fascist one. In reply, as it were, Orwell’s post-war Nineteen Eighty-Four is an attack on statism, not merely Stalinism, on the degradation of truth by the requirements of a privileged elite. The economy and how it is organised is hardly mentioned. In the 1950s, debate about the USSR was dominated by polarisation – by anti- and pro-Soviet views, with marginal characterisations of the USSR as degenerated socialism or state capitalist. Flewers covers all this in a telling discursive style. Another importance of the book is that it shows that there was constant informed criticism of the USSR’s planning regime. In 1935, an anonymous exile, a Russian engineer, published an appraisal of the planning process, calling it ‘chaotic’ and adding that ‘managers did not know what orders to follow’. Economist Michael Polanyi referred to the plan as ‘a series of loosely connected tasks’ and writers such as Walter Citrine and even Oswald Mosley referred to the formation as ‘state capitalism’. On the Comintern’s part in the Spanish civil war Louis Fischer wrote in the New Statesman that ‘the truth is that the communists’ saving, dynamism and discipline can have unpalatable by-products’. Even Chamberlain thought that the USSR was a revolutionary force no longer. The Comintern, he recorded, was a ‘lifeless, bureaucratised institution’. The turning point for most anti-fascists was the non-aggression pact between Stalin and Hitler in August 1939. Most of the disillusioned broke not with a USSR that had lost its revolutionary credentials, but one that could no longer be considered reliably anti-Nazi. The next move Stalin made excited even more hostility from previous sympathisers. Seeking a buffer zone, the Kremlin began to push at the border with Finland. The Finns refused any such arrangement and the Red Army invaded. The cold war had begun, but, with Hitler’s attack on Russia, it was put to one side for the duration. Flewers does not explore any of the individual psychology involved in a leaning towards the USSR – none of the usual speculations about the search for an alternative patriotism, the outsider’s resentment or the giving of significance to a life. With regard to the centre ground, the main attraction, he proposes, is ‘the lure of the plan’: the belief in ‘the potential and viability of the Soviet economy’, whether defined as embryonic socialist or a rule of experts no longer repeating the failure of free-market capitalism. Indeed, for HG Wells Stalinism was not authoritarian enough. One might add another reason: the tendency found in anti-fascism of siding with ‘my enemy’s enemy’. Recently, this tactical option of the late 30s, faced with the undoubted challenge of full-blown fascism, has become a philosophy (file under ‘multiculturalism’) where, for example, the discovery that a Muslim leader is ‘anti-imperialist’, or rather anti-American, is grounds for adopting them as a progressive ally. Here anti-imperialism slips from anti-colonialism and anti-capitalism into an ‘anti-Eurocentric’ support for the right of a national ruling class to rule their ‘own’ people. Finally, a broader point: centrist opinion in the 1930s could take Stalinism as a useful experiment in state ‘intervention’, because socialism – both social democracy and communism – had long since become identified with statism: that is, focussing on the state as the key to social change. Many theorists and tacticians contributed to this identification, from Bernstein and the Webbs to those Bolsheviks who supported the defensive and nationalist policy of ‘socialism in one country’. Even those in reaction to this interpretation of Marx and Engels, those who simply rejected the state – anarchists, Trotskyists – assumed that an instant revolution could be produced, while too often not taking seriously enough the political legacy of democratic republicanism: free speech, human rights, right to factions, etc. Flewers shows us, then, one period where the interest in statism was not confined to ‘left opinion’ – and how ‘left opinion’ found itself confined within general bourgeois trends to selective nationalisation and anti-fascism. As Mike Macnair has argued, left strategies of statism and anti-statism in the 20th century were not so much defeated as mistaken; not failures of will, but the wrong road. The statist left, in order to uphold ‘broad’ bourgeois movements and national ‘progressive’ governments, practised diplomatic discretion and fell into lies and ‘bureaucratic centralism’. Among the ‘anti-statists’, the question of promoting accountability was bypassed for policies of ‘practical’ action – the mass strike, terrorism – which, it was assumed, would liberate the consciousness of the working class. Socialists acquired the reputation of being either coalitionist sell-outs or spontaneist utopians, both authoritarian in tendency, instead of patiently getting together a movement that promoted criticism and practised democratic centralism. Tactics of permeation and coalition, however, are now plainly irrelevant: the ruling class is not playing ball. Sure, there are tax breaks for the market and bailouts for bankers, plus the odd consultation exercise, but social democracy is buried in the landfill of history. On the other hand, with the passing of Stalinism so recent, spontaneous revolution looks too scary a gamble. In the Critique of the Gotha programme Marx wrote: ‘Freedom consists in converting the state from an organ superimposed upon society to one completely subordinate to it.’ The only strategy remaining unsullied is to join together and subject the state to an international democracy of a socialised world. Paul Flewers is a member of the Revolutionary History editorial board and over the years has contributed numerous articles on different strands of the left and their understanding of the ex-USSR. He expresses a preference for Hillel Ticktin’s analysis of the class nature of the former Stalinist states, reflecting his years in the 1980s as a supporter of the Revolutionary Communist Party (now deceased). This book is something of a labour of love. Focusing on Britain, he provides an extremely comprehensive survey of the changing attitudes towards the Soviet Union in the period from the first Five-Year Plan in 1929 to the Nazi invasion of 1941, focused on the leftist intelligentsia, like the Webbs, Victor Gollancz, Victor Serge, George Orwell and Bertrand Russell. The title of the book, New Civilisation, is taken from the Fabian tome of the same name by Sidney and Beatrice Webb. Originally published with a question mark in December 1935, by 1937 the great purges, show trials and Ukrainian famine had convinced them the question mark was an unnecessary qualification and it was taken off! The New Civilisation had indeed been founded under the watchful eye of Uncle Joe. The Webb’s obsequious blindness to Stalinism’s flaws was by no means unusual in the period, and a running narrative through Flewers’ book is the contrast between the pro- and anti-communist flanks of public opinion. Flewers also refers to a more critical ‘centre ground of opinion’ – an odd description for Trotsky, Orwell, EH Carr and Victor Serge. Take his discussion of Trotsky’s Revolution Betrayed. Flewers first presents it in his discussion as how ‘fulsome praise for the tremendous changes made in the Soviet Union was not limited to the pro-Soviet lobby’ (p121). A strange way of introducing Trotsky’s devastating critique of Stalinism. He says the book, while a ‘sharp denunciation of the Stalinist regime’, ‘opened with a veritable rhapsody to the “gigantic achievements in industry”‘. This surely implies Trotsky had been misled by the achievements of the Five-Year plan. Yet Flewers concedes that when considering the developments in production made during the first Five-Year Plans, the ‘statistics look impressive’ (p138). How can the description of ‘fulsome praise’ be in any way appropriate to Trotsky’s analysis, when, as Flewers points out, the Revolution Betrayed explained that inside the USSR ‘social inequalities were deepening and becoming institutionalised, and it was now ruled by a privileged, totalitarian élite’. No he didn’t. When Trotsky referred to the bourgeois method of distribution, he was not suggesting that goods were distributed by the market, but rather that the bureaucracy plundered the output of the economy, siphoning off large parts of it to line its own nest, thus entrenching major social inequalities. The trouble is if a reviewer of this period can’t even get this right, which is, after all, the major theoretical study of the period, made by one of its key figures, then it’s difficult to have much faith in the rest. I am pleased with the alacrity with which Permanent Revolution reviewed my book The New Civilisation? Understanding Stalin’s Soviet Union 1929-1941. Unfortunately, Bill Jefferies’ enthusiasm to carry out this assignment has led him to make some assumptions with which I must take issue. Bill writes: There is a bewildering assortment of views and counter-views, which leave the reader wondering what the hell was really going on and what any of these various opinions have to do with it in the first place? This implication of incoherence is unwarranted. I did, as can be assumed, compile a vast array of material on the subject, taking in a wide scope of differing outlooks and opinions; indeed, so contradictory were some descriptions of the same phenomenon that one could almost think that the authors were looking at different things altogether. What I then attempted to do was to deduce from this mass the various schools of thought about the Soviet Union. A swift glance at my book might leave a reader with an impression of a bewildering agglomeration of rival viewpoints; however, at the risk of sounding arrogant, a more in-depth perusal will show that I have succeeded in giving a reasonably accurate portrayal of these various schools of thought. Of course, I would state that there were those who wrote this, and others who wrote that; how else could I describe this huge battle of ideas that was raging during the period under review? Bill correctly states that alongside the pro-Soviet and the anti-communist schools, I investigate what I call the ‘centre ground of opinion’, which, he adds, is ‘an odd description for Trotsky, Orwell, EH Carr and Victor Serge’. Indeed it would be, but a more careful look at my book would show that I was writing about totally different people. What I refer to as the centre ground was a range of commentators, from moderate conservatives through liberals to right-wing social democrats, who, in the light of the contrast between the deep slump in the West following the Wall Street Crash and the growth of the Soviet economy under the Five-Year Plans, and without forgoing their rejection of Stalinist coercion and terror, looked at the latter to see whether the capitalist world could learn anything from it. Alongside this was the idea that the Soviet Union was no longer a revolutionary threat to capitalism and might start to play a helpful role in the field of international relations. This was accentuated after Hitler came to power and German imperialism was recognised as an incendiary factor in Europe, and the centre ground duly called for an alliance of Britain, France and the Soviet Union to face down the Nazi threat. I devoted quite a lot of space to the centre ground for two reasons; firstly, because it has been very much overlooked in standard scholarship; secondly, because this period was most unusual in that a sizeable sector of mainstream politics in Britain felt that the West could learn something positive from the Soviet Union in the economic and social fields, and that the Soviet Union was actually capable of playing a moderating role on the international stage. This was in sharp contrast to the usual portrayal of the Soviet Union in mainstream politics, and particularly during the Cold War, as a totalitarian threat to Western civilisation. Trotsky and Serge were, as I pointed out, dissident communists. Orwell was unusual for a left-winger as he pretty much dismissed the entire Soviet experience. Carr differed from the typical centre-ground figures in that he opposed, on the basis of realpolitik, an Anglo-Franco-Soviet alliance against Germany. Carr did to some degree reflect the views of the centre ground of the 1930s, but not until the latter part of the Second World War, which was beyond the scope of my book. I am taken severely to task when it comes to Trotsky’s analysis of the Soviet Union. Nevertheless, I stand by my contention that The Revolution Betrayed was – as I wrote – a ‘brutally incisive work’ that was also ‘at times contradictory’. Why did I consider that it started off with ‘fulsome praise’ to Soviet industrialisation? I cited from it: ‘Socialism has demonstrated its right to victory, not in the pages of Das Kapital, but in an industrial arena comprising a sixth part of the earth’s surface – not in the language of dialectics, but in the language of steel, cement and electricity.’ How else can that be described other than fulsome? As Bill noted, I did write that the Soviet statistics ‘looked impressive’; indeed they did. But, apart from the various points that were raised by critical observers at the time, which I described at some length, concerning the reliability of the statistics and such key factors as the quality of Soviet produce, did such a quantitative increase of production merit the words ‘socialism has demonstrated its right to victory…’? One would certainly expect them from a Stalinist, eager to show the superiority of his ‘new civilisation’, or from a naive left-wing social democrat, unaware of the real nature of Stalinism, but not from a revolutionary Marxist. These words stood in contrast to the complex analysis of the Stalinist socio-economic formation in that book. I am then accused of misinterpreting Trotsky, in that I confuse his definition of the bourgeois method of distribution with the market, when he was actually meaning that ‘the bureaucracy plundered the output of the economy, siphoning off large parts of it to line its own nest, thus entrenching major social inequalities’, whereas I state that ‘the means of production were in the hands of the state, and were thus socialised and planned, whereas, because of the relative backwardness of the society, the distribution of everyday goods was carried out through the market’. Present market relations differ from relations under the NEP (1921-28) in that they are supposed to develop directly without the middleman and the private trader between the state cooperative and collective farm organisations and the individual citizen. However, this is true only in principle. The swiftly growing turnover of retail trade, both state and cooperative, should in 1936, according to specifications, amount to 100 billion rubles. The turnover of collective farm trade, which amounted to 16 billion in 1935, is to grow considerably during the current year. It is hard to determine what place – at least not an insignificant one! – will be occupied by illegal and semi-legal middlemen both within this turnover and alongside it. Not only the individual peasants, but also the collectives, and especially individual members of the collectives, are much inclined to resort to the middleman. The same road is followed by the home-industry workers, cooperators, and the local industries dealing with the peasants. From time to time, it unexpectedly transpires that the trade in meat, butter or eggs throughout a large district, has been cornered by ‘speculators’. Even the most necessary articles of daily use, like salt, matches, flour, kerosene, although existing in the state storehouses in sufficient quantity, are lacking for weeks and months at a time in the bureaucratised rural cooperatives. It is clear that the peasants will get the goods they need by other roads. The Soviet press often speaks of the jobber as of something to be taken for granted. We can conclude from all this that Trotsky recognised that whilst the market, which was largely tied in with the production and distribution of everyday goods, was an unavoidable factor as a result of the overall backwardness of the Soviet economy, and could not be eradicated by way of bureaucratic methods, it nevertheless posed a direct danger to the planned production and distribution of everyday goods through the state, and a less direct but ultimately no less serious danger to the entire planned economy. Hence there was in Trotsky’s analysis a contradiction between plan and market, unavoidable under the conditions of the time, but nonetheless one of a fundamental nature. I accept that my conspectus of Trotsky’s view of the contradictions within Stalinism might have been better expressed. Nevertheless, Trotsky did recognise the seriousness and centrality of the contradiction between market and plan within the Soviet socio-economic system, and that Trotsky’s definition of the bourgeois method of distribution did not exclude a recognition of this contradiction, but actually incorporated it.